The Coalition is wielding the scalpel on Medicare—again. As part of their December mini-budget, the government announced cuts of $650 million over four years to an incentive for pathologists to bulk bill patients. If they get away with it, the cuts will mean new fees for standard medical tests like blood tests, X-rays, MRIs, and pap smears. And because providers would be charging fees, under Medicare rules, patients would have to wait for rebates. This means patients will be out-of-pocket for enormous bills until they are able to claim the rebate. Abbott’s $7 GP co-payment was widely loathed, and rightly regarded as the thin edge of the wedge that would end with a two-tiered, user-pays health system. 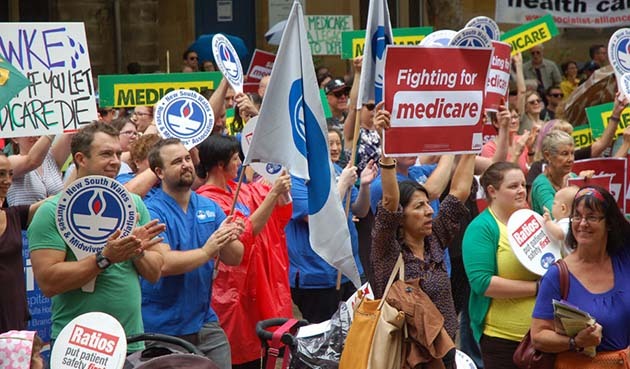 Community outrage and mobilising the unions through the Save Medicare campaign sustained such a backlash against the co-payment that the Senate refused to pass it, and the government was forced to retreat. Since then the Coalition has been searching for other ways to shift costs onto patients. The co-payment back down was accompanied by Health Minister Sussan Ley announcing a cocktail of reviews into the health system—six in total—that are still ongoing. They’re floating a dizzying array of potential changes to the health system, obscuring which options the government is serious about pursuing. One way they’re creating “savings” is by keeping the Medicare rebate frozen at the 2013 level, something started by the previous Labor government. This is slowly corroding bulk-billing. Half of the population access these tests once a year, meaning we’ll all lose out from the cuts. This comes on top of the costs of medication, which diabetes educators say is already unaffordable. Patients may skip tests, making their condition worse and increasing the likelihood of kidney disease, blindness and other medical complications. Worst hit areas will be places like Penrith in Western Sydney, which has the highest rate of diabetes in the country. As nurses at Nepean hospital in Penrith explained at a Save Medicare campaign hospital meeting last year, skimping on diabetes support by forcing patients to pay to access the GP or get tests simply means more hospitalisation, and more cases where patients cannot be operated on due to their diabetes. The money the government saves in one part of the health system will be spent in another with sicker patients, more deaths, and more hospital overcrowding. Pathology companies that perform pap smears and sexual health checks are forecasting a $30 charge per test. Again this completely undermines the benefits of investing in preventative medicine—catching disease at an earlier stage—that makes survival more likely and intervention less costly. Despite efforts to sneak the cuts through in December, as news got out, outrage spread very quickly, and momentum is building for nationwide rallies against the cuts on Saturday 20 February. Sussan Ley attempted to discredit critics by stressing that Medicare still covers the tests and the GPs that administer them. Yet the Coalition is effectively reducing the bulk-billing rate by cutting the extra incentive and pushing the providers into charging. New administration costs, and the bulk-billing freeze on top of this, make the losses even bigger. Paying up front will mean cancer patients paying costs such as $500 per test or in some cases as much as $1000. Mammograms, thyroid function tests and CT scans can also cost this much. These cuts are not “efficiencies”—they will increase healthcare spending. But shifting the burden onto us is the government’s version of efficiency. Increasing the costs of primary care is also a way to allow private health insurers into the sector, and displace Medicare. This would replicate the US system that’s one of the world’s most expensive and inefficient. These cuts must be resisted—and they can be defeated. While the measures can be implemented through regulation, they can be disallowed by the Senate. The campaign must demand that Labor, Greens and the crossbenchers do just that. The government is scared of the backlash that stopped the co-payment. They know that public healthcare is hugely popular. Building a united, union-backed campaign can turn these cuts into an albatross for Malcolm Turnbull’s neck. Coup culture: Why is Australian politics so unstable?